If the magnets aren't pulling the items then that just means that they were hardcoded to support vanilla items only and not subtypes/variants. That's not something I can fix from my side. I have seen other magnet mods work just fine with these items so please take it up with the developer of the magnet you are having issues with. Next time can you please describe your issue in detail the first time and not be so demanding for a fix. Not a lot of people would be willing to so much as dignify that with a response let alone help 'fix' anything. Fishing seems to be a bit janky currently. More times than not the fish don't get pulled toward you upon catch but rather float in the water at the bobber location. I'm not sure if there's anything you can do about this. Thank you for the great mod, by the way. Is it possible to completely disable picking up items by clicking and just use the normal way of walking over them? Even when turned off it interferes with block placing if there is an item there since you are still able to manually pick things up. Just posted up two new builds (1.0.9 and 1.1.10) which should fix the manual pickup not being disabled when auto-pickup is enabled. Thank you. Just tested and it works great! Are you aware that this mod idea is already out there a verry long time under the name ItemPhysics? Either this is a replication, or a clone of the original mod. Are you aware that this mod is not meant to function the same. There was also no Curse version of that mod as of 5 days ago. This is not a clone nor a replication. I wrote this from the ground up in the way I'd like to see and interact with item drops. - Besides buoyancy, I have no intention of modifying the physical properties of the item entities so that they may still abide by normal destruction rules and remain as compatible with modded machinery as possible. - I don't make items do fancy flips in the air, it makes them much harder to catch (It doesn't make much sense to me either). - This version is completely standalone with no core mod dependency needed to make it work. - The focus of my version is not physics but rather item appearance and interaction. I'm not saying you should use one over the other but considering them the same mod is not an accurate assumption. PS: Buoyancy physics was only added because many people requested it. It wasn't originally going to be added. I've got a weird bug. Dropping items on the ground doesn't remove the item from the player's inventory. Not able to recreate this in dev. Do you have any other mods that could be potentially modifying drops? Is it possible to allow players to decide if they want to automatically pick up items or not, if the server allows it? I personally enjoy not getting my inventory cluttered with cobblestone, however, I've had to sleep on the couch the last few nights, as my girlfriend dislikes having to right click each item to pick up. Hope you'll consider! Awesome mod! can you configure so you have to stand right on top of items to pick them up and not half a block away from them? i tried the settings and couldnt do it there nothing changed is it a bug or am i doing it wrong? Server Interaction? Would the server require this? has it been tested on a server? If just the player has it does it only function aesthetically? would it cause issues if a player only had it client side? What if just the server had it? would it not allow players to join? Item floating, sprint tossing and auto-pickup functionality is done server side. Modified item rendering is done client side. Both sides must have the mod installed for it to work correctly. Yes I have tested this on a dedicated server. Thanks for letting me know Funwayguy :D I've always loved your mods! So, now Items won't dissapear? Vanilla item de-spawning rules still apply. you are so awesome. 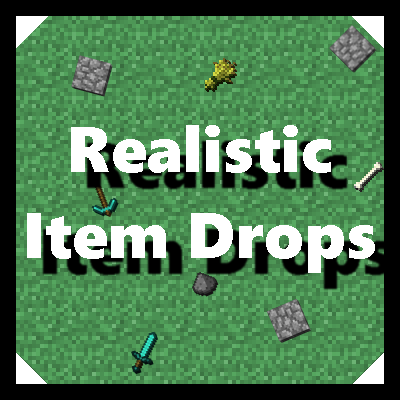 but could you make items spin as they fall, and if you shift-right click an item with a slimeball it won't despawn until it is picked up and dropped again? Because the origin point on items isn't always centred, making them spin looks weird. On top of that it looks really bad and unrealistic (I've tried). That slime ball idea just seems really unnecessary. Why would you want an item entity to just sit there forever. 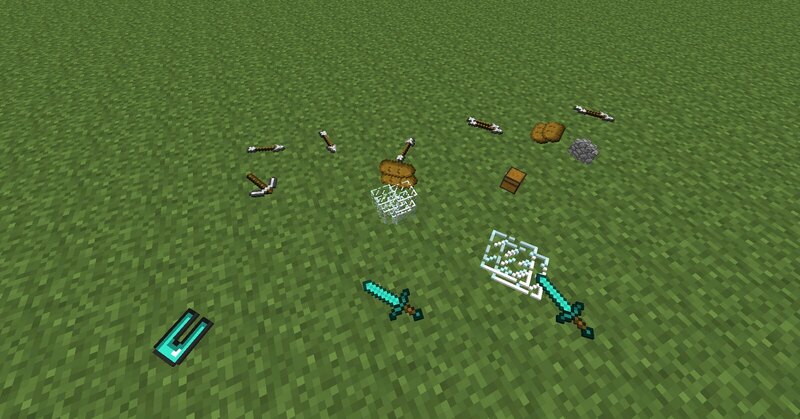 There's a reason Minecraft cleans out old items. I should note that I have no intention of adding any more 'features' to this mod. It's meant to stay simple and to the point without unnecessary bulk people have to configure.